Der vorliegende Band bietet eine vollständige Sammlung und eingehende Interpretation jener in neuassyrischen Texten (Annalen, Feldzugsberichten, Orakelanfragen, Briefen usw.) des 9. bis 7. Jh.s überlieferten Personennamen, die sicher oder sehr wahrscheinlich iranischen Ursprungs sind; berücksichtigt sind aber auch die Namen, die an iranische Namen anklingen und von Früheren zu Unrecht als iranisch erklärt wurden, sowie solche, die in toponomastischen Ableitungen verborgen sind. Die Basis der Sammlung sind die 5 Bände (Helsinki 1998ff.) und die Materialien der "Prosopography of the Neo-Assyrian Empire". Die Assyrier waren unter Assurnasirpal II. und Salmanassar III. im 9. Jh. v. Chr. erstmals mit iranischen, v.a. medischen, Stämmen in direkten Kontakt gekommen, die sie zum Teil unterwerfen und sich zeitweise tributpflichtig machen konnten. Die Namen iranischer Herkunft stammen also vorwiegend aus dem Medischen. Die Präsentation der 178 Namen erfolgt wie in den früher erschie¬nenen Bänden des "Iranischen Personennamenbuches": Auf die vollständigen Belegstellenangaben folgt eine prosopographische Skizzierung der Namensträger; den Hauptteil bilden dann jeweils die Abschnitte über die Deutung des Namens. In Anbetracht der oft kontroversen Forschung und der Unsicherheit vieler Interpretationen erwies sich eine ausführliche Diskussion häufig als unerlässlich. Detaillierte Register erschließen das Vergleichsmaterial, das dabei zur Sprache kommt. 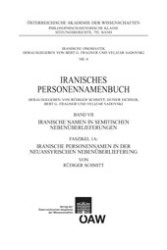 This volume of the Iranisches Personennamenbuch (Lexicon of Iranian per¬sonal names) presents a full collection and detailed interpretation of those an¬throponyms attested in 9th 7th c. Neo-Assyrian texts (annals, reports on mili¬tary campaigns, oracle inquiries, letters etc. ), which certainly or quite probably are of Iranian origin; but it takes into account those names too, which are remi¬niscent of Iranian names and previously were explained as Iranian by mistake, and those, which are latent in toponyms containing them. The collection itself is based on the five instalments of the Prosopography of the Neo-Assyrian Empire (Helsinki 1998ff.) and the material gathered for it. It was under Assurnasirpal II and Salmanassar III (9th c. BC) that the Assyr¬ians for the first time had come into direct contact with Iranian, esp. Median, tribes, whom they partly could subjugate and at times could lay under tribute. Thus the anthroponyms of Iranian origin mainly belong to the Median dialect. The 178 names are presented according to the model of the earlier volumes of the Iranisches Personennamenbuch: The full listing of the references is fol¬lowed by a prosopographical sketch of the person(s) bearing the name in question; the major part is the discussion of the etymological interpretation of the name. This often must be rather detailed in view of the conflicting opinions and the unreliability of many interpretations. Full indexes make the words and names accessible that are quoted by way of comparison.